Photo Collage blankets for your home! MyPix2 offers 4 different styles of blanktes with many design options to help you create the perfect gift! *Sizing shown based on a Standard 80 x 80" Queen Mattress. Our custom collage blanket comes in several sizes and styles and is a fun, unique way to display your photos. It’s sure to add color, warmth and character to any room and is perfect for snuggling up while watching a movie or relaxing with friends and family. 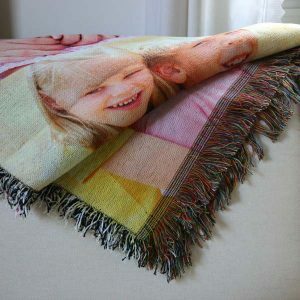 Choose from several sizes and materials and design the ultimate personalized collage blankets for you and your family. From custom woven photo blankets to personalized duvet covers, we have the perfect blanket to brighten you home! Our collage fleece blankets and various other styles are a great way to show off and relive your favorite memories and make an amazing gift any time of year! Furthermore, our collage blanket maker is easy to use so you can finish your layout in minutes! For personalized blankets, look no further than MyPix2. Speaking of gifts, why not create a gift set? Our photo pillowcases pair perfectly with our collection of photo blankets and are guaranteed to transform your bedroom decor into something both stylish and unique! Select from multiple sizes including small, medium, large and extra large; ideal for any bed or couch. Choose from various photo collage blanket layouts and template styles and even add your own text. 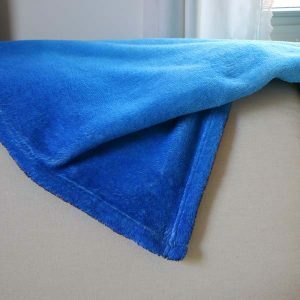 Perfect for couch throws, baby blankets and more. Choose from fleece, plush fleece, woven, and Sherpa styles. Whether you want to design a large plush fleece blanket or create your own woven tapestry for your wall, MyPix2 makes the process simple. Our collage blanket maker presents you with multiple layout options and templates so you can create a cozy accessory that compliments your style. Whether you’re looking to update your decor or create a stunning gift, our personalized collage blankets are guaranteed to please. Begin by uploading your photos to MyPix2 to save them to your account. Then, choose your blanket size, material and select a portrait or landscape orientation for your design. Afterwards, choose your background template or collage arrangement to display your photos. Once your blanket opens in the project builder, you can simply drag your photos into place and later add your own text if desired. Finally, review your blanket design, add it to your cart and place your order. Our custom photo collage throws and blankets not only make a great addition to your living room or bedroom but are also ideal for any gift-giving occasion. Just gather your favorite pictures and let your creativity flow. Our custom fleece blanket is great for adding a little color and personality to your living area, family room or bedroom. Drape a fleece picture collage blanket over your couch for instant color or keep one by your favorite chair to stay cozy with your fondest photographic memories. 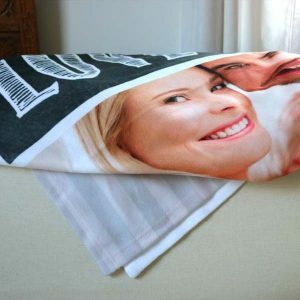 Since our custom fleece photo blankets come in 50×60 and 60×80, they can be designed for any size sofa or bed in your home and are great way to show off your favorite pictures in a unique way. Our project editor makes designing your personalized collage blankets fun and simple! Pick from multiple photo collage designs and fill it your best photographic memories. Perfect for cute pictures of the kids, pets, holiday photos and more. The options are endless. 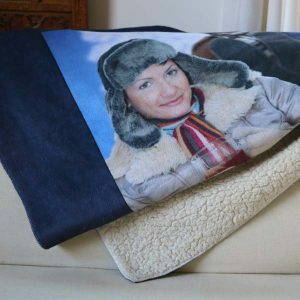 If you’re looking for something for those cold winter nights and a whole lot of style, you can’t go wrong with custom photo plush fleece blankets. Designed for maximum warmth and comfort, plush fleece is sure to keep you cozy with your family while relaxing in bed or on the living room sofa. They also are perfect for highlighting your favorite photos and giving any couch a burst of color and character. Our custom woven photo tapestry blanket is not only great for staying warm but can also make a great addition to your wall decor as well. Choose from two sizes including 50×60 and 60×80 and add your own photos. Drape your it over your couch for a rustic look or hang it on your wall to add warmth to any room in your home. Whether you use it to keep warm or for an update to your wall decor, our custom woven photo blankets are sure to fit the bill. Just like our custom photo collage fleece blankets, our personalized sherpa blankets makes a great sofa throw or blanket to keep you cozy all year long. No matter your decorating style, you can choose from several background colors to not only accent your photos, but any decor color palette. Showcase your best pet photos, kids’ school pictures or special family moments with our variety of photo collage arrangements. Our Sherpa fleece will make a great addition to your home that the whole family will enjoy and is guaranteed to spice up your daily routine by showcasing your favorite memories in style. A little thicker than our fleece photo collage blanket, its sure to keep you cozy on those cold winter days. Maybe you have a collection of wedding photos stored away on your hard drive or you want to display some stunning landscape photos you took during your last trip to the mountains. Using your favorite photos, you can dress up any room by designing your very own photo collage throw or blanket. They come in a variety of photo layout options and can be fully customized so that you can add the photos you want to build the perfect arrangement. You can even add your own text to give it more personalized look and choose from several backgrounds of varying styles, colors and patterns to accent your cherished memories. From our custom photo plush fleece blankets to our woven photo tapestry, you can create your own personalized photo masterpiece that is sure to impress! Whether you’re designing a custom photo duvet cover or a custom collage blanket for your sofa, you can easily jazz up a room with your own colorful memories. Maybe you’re looking for a unique throw for your living room sofa. Choose a background template that matches the color of your room and add your best vacation photos to fill your living space with your fondest remembrances. Our custom photo collage fleece blankets also make a great addition to your bedroom. Lay them out on your bed for a decor accessory bursting with personality. Our available background templates include floral prints, contemporary colors and more so you can compliment any decorating style. Not only will our blanket options brighten the look of your home, they’ll provide you comfort on those cold winter nights! Not only do we offer blankets, we have a large selection of other home decor options for every room! Create your own own custom dinner mats, or design your own pillow to liven up your sofa. Photos are worth a thousand words, so why not use them to give your home a one-of-a-kind look! Whether its Grandma’s birthday or a close friend just had a baby, our photo collage blankets are guaranteed to be a gift that is well received, no matter who’s on your shopping list. Pick a collage photo blanket size and style that’s just right and load your design with your loved one’s favorite photos and text for a unique, personalized look. Your friends and family will love snuggling up with their favorite memories and enjoy how it brightens up their decor with color and character. For Grandma’s birthday, why not create a large plush fleece blanket for her that she can keep on her couch for those chilly days at home. Design a collage with her children and grandchildren’s photos and pick out a background template that accents her sofa. It’s a gift that she’ll truly love and cherish. No matter the occasion, our customized throw is sure to make a great gift for friends and family alike. We even have a photo collage woven blanket for a unique wall decor hanging. Upload your loved one’s favorite pictures to MyPix2 and create an amazing gift that they can use and admire for years to come. Whether you want to spice up your decor with your treasured photos, add a little color to your living room sofa, or create a special gift for someone you love, our collage photo blankets are a great way to showcase your most cherished pictures. Designing your own blanket couldn’t be easier with our convenient project editor and the process is fun. Just choose a template that suits your style and drop your photos onto your chosen layout for a design that’s uniquely “you”. Not only are MyPix2 photo blankets practical for keeping cozy, they will add interest to your family room or bedroom and brighten up your home with your most beloved memories, year after year.